Lehn Painting, inc. has a team of experienced Epoxy Floor Installers that guarantee excellence in Epoxy floor solutions. Epoxy floor coatings are a durable solutions for residential, commercial and industrial environments. Our Epoxy floor installers apply these Epoxy floor coatings over concrete floors to provide a high performance, attractive surface. Epoxy Floor coatings are ideal for facilities, retail spaces, garages and more. If you already know the Epoxy floor surface that is right for your business, give us a call. If you need a consultation to figure our what surface is best for your home or business, fill out our free quote form and a Lehn Painting representative will be in contact with you momentarily. We will inspect the environment and help determine what Epoxy floor coating would be best for your situation. Our Epoxy floors have several benefits. Below is a summarized list of some of the reasons why you might consider Epoxy floors for your home or business. Epoxy floors are easy to clean allowing for easy mopping and resistance to most chemicals and stains. Epoxy floors provide extreme durability. The Epoxy coating minimizes wear and keeps your home or business environment looking clean and safe. Epoxy floors look great. Epoxy floors provide a contemporary and sleek flooring surface, creating an attractive environment for businesses. Epoxy floors are a chemically resistant floor surface. In industries that use chemicals, Epoxy floors make it easy to clean and keep an environment free of stains. Epoxy floors are not easily damaged. If an Epoxy floor is damaged, it takes minimal work to repair the surface. If you are interested in learning more about the benefits of choosing epoxy floor coatings for your industrial space, commercial property, factory, laboratory or home please feel free to contact our epoxy floor installers. 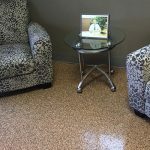 We can work with you to explain the advantages of using epoxy floor coating products and offer color and pattern solutions unique to your business or home. 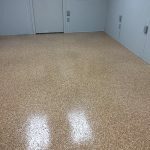 You will find that our epoxy floor paint application services can create a long lasting, hard wearing, and durable surface for your commercial or industrial floors but also great for garages and finished basements. Our epoxy flooring solutions come with a satisfaction guarantee. Lehn Painting has been installing Epoxy Flooring solution in the Cincinnati, Ohio, Kentucky and Indiana regions for over 20 years.